Katie Williams has been dancing for over 20 years. 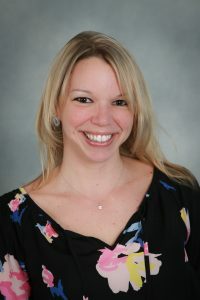 She began her dance education locally in Liverpool, NY under the direction of Dayna Williams of Step-N-Time Dance Studio. While dancing for Step-N-Time she was a winner of numerous awards for her solos and group numbers in such styles as jazz, lyrical, and tap. A 1998 graduate of Liverpool High School, Katie moved on to the University of North Carolina at Greensboro majoring in dance. While at UNCG Katie took numerous classes daily in ballet, modern, tap, jazz, and choreography. She was also a member of the UNCG Spartan dance team performing at numerous college games and events throughout her college career. At the same time as attending college she also taught at DANCE USA Dance Studio in Ashboro, NC. In 2003, Katie returned to Syracuse and taught for The Dance Studio of Manlius and Fairmount, and later became the studio’s assistant director. During her years of teaching her choreography has won numerous awards including high scores among the competition circuit of central New York. Katie was also the choreographer for the “Radio Disney Wolfpack Dance Team” for 3 years. Since the inception of TMB in 2009, she has continued winning choreography awards and special recognition awards with numerous routines. Teaching classes from creative movement to hip-hop to tap and many more, Katie continues her dance training by attending numerous workshops and classes. Recently she attended the Dance Teacher Summit in NYC. Taking class with amazing artists such as Greg Russell, Desiree Robbins, and Mandy Moore of SYTYCD!